Crate training is all the rage in the dog world, but what is it exactly and is it the right choice for your new pup or older dog? And more importantly; how does a pet owner crate train their dog? For many years the thought of crate training sent shivers down pet owners spines. The thought of pups and dogs being locked for endless hours in small confined areas has many up in arms over the dog training method. However, this cannot be further from the truth. Today, the practice is much more accepted. People have come to understand the positive benefits for both canine and human when it comes to crate training them. And with more understanding, the more accepted the crate training has become. For many, particularly dog breeders, this is the most successful way to help your pup feel secure and also fast track their toilet training. So what is crate training? Dogs like to have a den or a safe zone to retreat to. The crate will become this ‘zone’. It is very important that your dog only has positive experiences within his/her crate. So in the beginning, it’s important for them to build up a good bond with the crate. Feed them yummy treats inside and pop their bedding and favourite toy inside the crate. Encourage your pup to sleep inside the crate. Don’t bring your puppy straight home and lock them inside the crate! This will only inforce that the crate is not a nice place to be, and will most likely be followed by loads of yelping and howling. Give your pup some time to explore the crate area and don’t forget to leave the door open. The key is to be patient and let your pup get used to the area. If your breeder has been using a crate the transition will be easy. Some breeders will begin crate training for a small period of time per day to get their pups used to travelling in their travel boxes. Make sure your crate is the right size! You can start closing the door once your puppy feels secure in the crate. They will yelp for a little while, so only leave the door shut for a very short time. Only open the door during a yelping break (you may need to be quick) so your pup doesn’t learn that yelping will get the door opened. Extend the time each day. Soon your pup will be content to sit in the crate until you return. When should you use the crate? Dog crates are great for night-time sleeping. You can also position the dog crate close to your bedroom. Then you know your pup is safe, sound and secure. Dogs will also not toilet in their sleeping area, unless desperate, meaning they will hold-on until you take them out. So before you go to bed, take your pup outside and encourage them to toilet. Ensure they do toilet before popping them back into their crate with their favourite toy. They will soon settle on their bed. 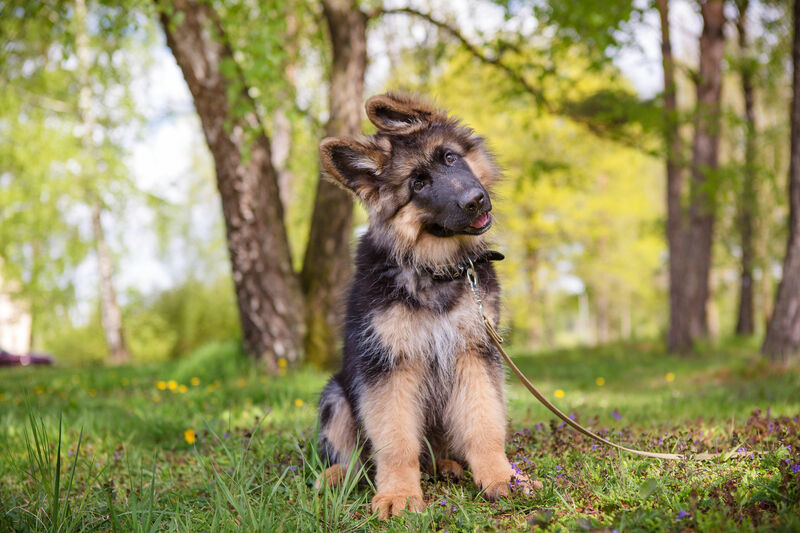 Then in the morning when puppy starts to whine (normally this will be quite early), take them outside to toilet (add your ‘quick go’ command) and your dog will learn to toilet on command. Remember big praises. You can also use your dog crate if you are popping out or if you cannot supervise your puppy. But don’t keep your pup or dog in their crate for too long. The dog crate can also be used for safe car travel and you will find your pup will soon love hanging out in their crate or penned area. In fact, many will take themselves off to their crate when they are in need of some quiet time from the busy family home. Many crate-loving pet owners like to take the crate anywhere their dog is going. Be it a camping trip or a holiday, the crate is collapsible and easy to transport, and provides a portable ‘safe zone’ for their dogs. Your dog will simply love their crate area. Plus you will have a toilet-trained pup in no time at all! Would you like to know how to crate train your pup or older dogs? Stay tuned! Nadia Crighton is a well-known and accomplished Australian journalist and Pet Magazine editor. As a busy mum of four humans, two dogs, 50 sheep, one cat, a handful of chickens and a goat named Billy (and let’s not forget the axolotls! ); she simply adores pets of all shapes and sizes. These are her personal thoughts and advice from many years of pet-ownership and working within the pet industry.